For those requiring a dash more travel in their Enduro rig, the Process 153 DL offers the versatility of 27.5-inch wheels with exceptional pedaling and suspension performance that will keep you pinned on the descents. The linkage incorporates the same large bearings as the 134, while the frame geometry features a low BB, using the shortest possible chainstays for a nimble, responsive ride, but at the same time increasing the front center of the bike, allowing for a slack 66.5-degree headtube angle, longer toptube and a short (40mm) stem. Kona 7005 and 6061 Aluminum alloys are used extensively throughout our fleet of mountain and asphalt bicycles. A tough, durable, affordable, light alloy, both Kona 7005 and 6061 deliver fantastic, reliable performance that lasts for thousands of rides. Much of our 7005/6061 tubing is butted and/or formed, meaning the tubing’s wall thickness can be increased or decreased, as well as shaped, allowing us to fine-tune a particular frame’s strength and ride characteristics depending on its intended application. By having the headset bearing located inside the headtube (called “zero stack”), rather than the top and bottom, we are able to achieve a number of advantages when it comes to front-end stiffness, durability and overall riding performance. The major benefit of an internal headset is the extra layer of protection it provides the bearings against the elements. Additionally, the bearings are commonly available angular contact bearings, which are easily and inexpensively replaced. An internal headset also reduces stack height, so the height of the stem and bars are more adjustable, giving the rider the best fit possible. Aside from improving the aesthetic, due to its cleaner lines and smooth transition between the fork crown and the headset cover, tapered headtubes also offer a more solid interface between forks with tapered steertubes and the bicycle frame itself. More girth at the bottom of the headtube better distributes shock force, prolonging the bearing life of the headset itself. The inherent strength of its triangular design also means a stronger steering position and improved balance, giving the rider more control in rough terrain. A zero-stack, tapered headtube also puts strength where the load is going—into the lower headset cup—maximizing bearing durability where it’s needed. Kona warrants to the original owner that their new Kona bicycle frame purchased from an authorized Kona dealer shall be free of defective materials or workmanship for the lifetime of ownership by the original owner. This warranty is limited to five years for carbon fiber frames. During this warranty period, Kona shall repair or replace, at its sole option, the bicycle frame if Kona determines the frame is defective and subject to this limited warranty. The original owner shall pay all labor and shipping charges connected with the repair or replacement of the bicycle frame. Please see the Kona owner’s manual, provided with your bicycle, for additional information. An increasing amount of 2014 Kona models feature the benefits of tubeless compatible rims. Tubeless rims allow for tires with more puncture resistance, better tire grip on the trail, lower rolling resistance and weight savings over traditional tube + tire systems. For 2014, you’ll find tubeless compatible rims on most of our XC Race Light and Enduro bikes, as well as throughout our Cyclocross and Road platforms. The XC/Trail/Enduro 12x142mm and the DH 12x157 rear axle standards provide two major advantages to the Kona rider: the 12mm diameter of the rear axle provides the rear hub and frame with a stiff interface, while the 142mm/157mm outer diameter of the hub allows the wheel to be quickly and properly positioned in the frame before the rear axle is inserted. The take-away? 12x142 and 12x157 standards make a bike that rides better and is easier to work on. Different riders have different needs, but Trail and Enduro riders need a lot of everything—from downhill performance to stable pedaling. With Rocker Independent Suspension we found a healthy balance between the down and the up, while also designing a suspension platform that was as compact and low-slung on the frame as possible for maximum standover, stiffness and maneuverability. We developed our Rocker Independent Suspension to achieve all of these goals by creating a consistent leverage rate curve that perfectly matches currently available air shocks. This allows the suspension to provide a stable pedaling platform, while giving the rider a predictable feel throughout the travel. Dropper posts are a key element in riding technical singletrack. No surprise then, for 2014 we’ve spec’d dropper posts on numerous models throughout our Enduro and MTB Trail platforms, featuring the lightweight and proven seat posts from Kind Shock. Bikes like the Honzo, Taro and new Wo fat bike do not come equipped with dropper posts but have cable routing to allow for after-market upgrades. Fit is the prime contributor to comfort and confidence on any type of bike design. It is especially critical on Trail/Enduro bikes where the uphill speed and efficiency an XC bike needs to be is at balance with the control of a downhill bike. 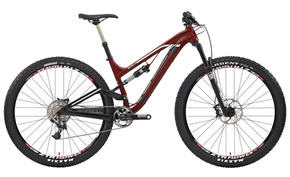 Trail/Enduro bikes currently on the market are still subject to the traditional fit and sizing mountain bikes took from road-bike sizing standards, whereby seat tube length defined the sizing, and stem lengths increased with frame size. As a result, riders have been forced to replace stock stems because they are too long for use in technical terrain. While this Band-Aid solution has improved the ride, we would argue that the balance of the bike has been negatively affected. Radically shortening a stem, without regard for the geometry of the bike, will create a bike that is too small, and it shifts the weight bias rearward and creates a steep head angle, resulting in a twitchy ride. No good. In 2012, Kona took the modest step of offering a Trail hardtail with a longer reach, shorter stem and slack head angle. To balance the wheelbase growth from the longer reach we aggressively shortened the chainstays. In 2013, we built on this by offering the first Process model, featuring the same formula: long toptube, short stem and short chainstays. In 2014, we are turning it to 11 by offering three different Process models, each with the trailworthy balance of long reach, short stem, slack head angle and short chainstays. On our XC Race bikes, we feature longer toptubes coupled with shorter stems and slightly shorter headset stack heights. The steps between sizes are at half-inch to one-inch increments, with up to seven sizes ranging from 14 to 22 inches on many models. In our Commuter and Road platforms, size gaps are even at 15 to 20mm steps. There are still up to six sizes, from 46cm to 61cm on most models. When it's called for, seat posts are either offset or straight to maximize the reach and power output of the rider. More importantly, our comprehensive bike sizing allows Kona dealers to determine rider fit more easily from model to model and category to category. Introduced on the Kona Explosif in a mid-season launch last year, for 2014 you’ll find 27.5-inch wheels on the Process 134 and 153, the Explosif, Cinder Cone and Blast. The benefits of the 27.5-inch wheel are simple: they roll over obstacles and track better than 26-inch wheels, but are more maneuverable and nimble than 29-inch ones. They are, quite literally, the best of both worlds. Specifically for Trail and Enduro applications, they noticeable increase overall performance and ride confidence.